Pen Flower Planter – In the Home with Cynthia Gagen | Who Are You Calling Crafty? 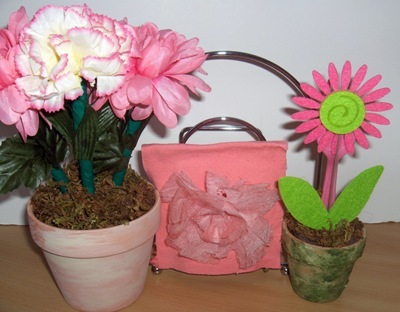 On Friday, the amazingly-crafty Cynthia Gagen did a wonderful demo on how to do a Pen Flower Planter. I can not wait to make one for my grandmother’s Ice Cream Shop for her pens she is going to love it! The flowers are pens – I think that is the cutest thing in the world! My flowers will be daisies because my grandma LOVES daises! This a great easy project – click here for the playback! I think my daughter are going to do this on Monday for my grandmother (no school)! Also don’t forget to join Cynthia Gagen and Roberta Cohen for In the Zone on the Interactive Creative Edventures WebTV Channel! It is a LIVE show at 9pm EST in the Linqto Creative Edventure Room (NO PRE-RECORDINGS, COMMERICALS OR WEB CAM NEEDED!) Come chat with the ladies, ask questions and enjoy the laid back atmosphere of crafting with Cyn and Robi! Their show’s theme on Monday happens to be one of my FAVORITE SONGS: Karma Chameleon. Hope everyone has a wonderful weekend and check out Cyn’s awesome Pen Flower Planter and In the Zone on Monday Night at 9pm EST! Awwww thanks Amanda!!! I appreciate it. Can't wait to see the one you and your daughter make! The biggest downside of solitary life involves personal safety, as women on their own do not have roomies or family to regularly check in on them or keep an eye out for suspicious activity.